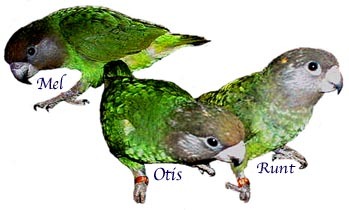 So what is an African brown headed parrot? Well, if you've heard of a Senegal parrot or a Meyer's parrot... Brown heads are a lot like that! Senegals, Meyer's, and brown heads all belong to the Poicephalus family, along with Jardine's, red bellies and a few more species - nine total. Brown heads are one of the least common in captivity, and a lot of people haven't heard of them. But they are available as pets when you can find them, and make very good ones - at least as good as their more common cousins... And I'm a bit biased, but I like them even better!